I was startled, and stumbled over my words: “I … uh … what?” But before I could gather my disjointed thoughts, a terrified bird had been thrust into my equally nervous hands. The bird was coated in sticky, tarry muck. Its feathers lay in tangled snarls, and tiny bits of thread and paper protruded from the surface. I felt the fluttering of its heart, and the living warmth of a squirming, frightened animal. Soon it was gone, back into more professional care, as the wildlife rehabilitator finished preparing the cage, and gently placed the bird inside. I was on the Upper East Side of Manhattan, and the bird that I held was an unfortunate pigeon, caught in a glue-like bird repellant common to windowsills around the city. Helen Lucievics, the woman who was tending to the pigeon, is a volunteer at the Wild Bird Fund, a non-profit charity that rescues and rehabilitates wild birds in New York City. 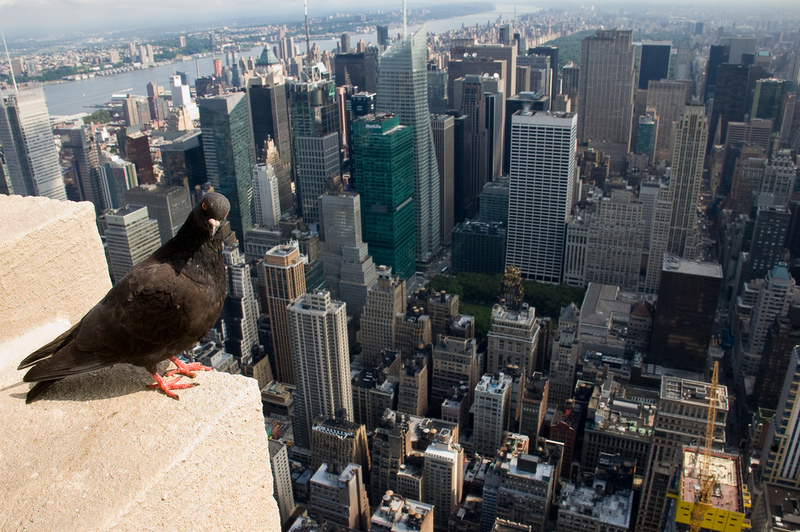 Wildlife and New York City might seem like two utterly incompatible concepts, but New York sits on the migratory pathway of many bird species, such as woodcocks and geese, and countless squirrels, pigeons, and a few species of sparrows are life-long city dwellers. Most New Yorkers overlook these animals, but there is a small, specialized group of people within the city who protect and care for injured wildlife. There are only 18 state-certified wildlife rehabilitators and five assistants in New York City, a staggeringly small number for such a large metropolis. The small numbers may be because the position of wildlife rehabilitator isn’t a job, but rather a vocation. The time spent caring for any wild animal is enormous; feeding regimes, for example, occur at regular intervals, sometimes up to 6 times a day, every day for as long as 12 to 15 weeks. Then there’s the money, or lack thereof. Rehabilitators don’t get paid, so all costs for care come out of pocket. “It adds up. That’s why not many people do this,” said Maura Mandrano, a rehabilitator from the Bronx. Mandrano once calculated that she took care of 20 to 30 injured or abandoned baby squirrels a season at a cost of approximately $280 per squirrel, or $5,600 for every nesting cycle (at least two per year). Expenses aren’t likely to go down anytime soon, but there is a new hope on the horizon. New York has long held the dubious distinction of being the only major U.S. city without a wildlife rehabilitation center, and the Wild Bird Fund is trying to change that. “Phoenix has three, Chicago has two, we have nothing,” said Rita McMahon, a rehabilitator who started the Wild Bird Fund with Karen Heidgerd of Animal General, an animal hospital in Manhattan. Up until now, the Wild Bird Fund has been based out of McMahon’s home and Animal General, a few blocks away. McMahon is caring for 22 birds in her home right now, and many others are either residing at Animal General or with volunteers all over the city. She has plans to make everything more centralized, and just signed a lease on a storefront across the street from Animal General. She points to the bright pink interior of the store, conjuring images of how this former pet fashion shop will become an intake center for wildlife before they are sent out to individual rehabilitators. The left window will hold a small pool for waterfowl, and in the right, passers-by will see baby birds being fed during the spring. An open space on the ground floor will be for lectures and educational events, while the basement will hold an examination room, incubators, and supplies. The center won’t open before the fall of 2011, but it is already getting extraordinary support. An anonymous donor gave $250,000 to the cause, and painters and small telephone companies have volunteered their services. It will be small at first, but the intake center and the storefront will provide some physical stability to the currently disconnected community of wildlife rehabilitators in the city. Wildlife rehabilitators are licensed by the New York State Department of Environmental Conservation to tend to wounded or suffering wild animals and then release them back into the wild. A Class One license, the most basic, allows a person to care for any species that are native to New York and don’t transmit rabies. All animals from squirrels to moose are fair game, though the rehabilitator often picks a single animal to specialize in. “In my small apartment, and with my lifestyle, squirrels were the only ones I could handle,” said Mandrano, the Bronx rehabilitator. She specializes in neonatal squirrels, caring for the orphaned or injured infants until they can be released into parkland or quiet wooded areas. She has been a rehabilitator for nearly eight years, ever since she found a small baby squirrel outside a pizza parlor. She and her boyfriend nursed it back to health. “We did everything wrong — I look back on that with horror” she said. Three months after she released it, she found that the squirrel had crawled up the outside of her three-story building with a broken leg, and was lying unconscious at the base of his childhood nest, a bookshelf near the window. She frantically called zoos and vets, but no one would take the squirrel. Eventually, she heard about a woman that worked as a wildlife rehabilitator, and Mandrano was able to get the squirrel to her and save the animal’s life. The rehabilitator set just one condition for accepting the squirrel: Mandrano had to take the test and become a licensed rehabilitator herself. Getting licensed isn’t extraordinarily difficult. You send an application and $15 to Albany and receive a study guide in the mail. Then you take the written test at one of the DEC regional offices. Then, after an interview with a DEC representative, you are officially licensed. Each year, you must send in a log of every animal that you’ve cared for showing whether it was successfully rehabilitated, or died. The test covers basic questions for the rehabilitation of a wide swath of species, but not the detailed and specific skills needed to care for each type of animal that a rehabilitator might come across. Because of this, learning on the job is critical. Barbara Bellens-Picon, another squirrel specialist, has a Class Two license that allows her to train and work with people that haven’t gotten their license yet. Even with a lot of experience, it helps to have relationships within the world of wildlife rehabilitation. “You have to network. It’s not something you can do alone,” said Bellens-Picon. Networking takes place at the annual rehabilitators conference, where workshops showcase new methods and techniques. Wildlife rehabilitators in the city face special challenges. The towering glass buildings of the financial district are directly in a migratory flight path, and birds often crash into the windows and fall to the ground, concussed. Pigeons and sparrows like to build their nests near food sources in populated places, so if their fledglings fall out of the nest, they are often in great danger from humans and pets. Often the volume is overwhelming, especially during nesting seasons, and without the proper support system, many rehabilitators stop. “The shelf life for rehabbers is just a couple of years,” said Bellens-Picon. But a network can help a rehabilitator weather the flood of patients. Every rehabilitator to whom I spoke mentioned the importance of having a good relationship with a veterinarian willing to care for wildlife at a discounted rate. Wildlife rehabilitators can bandage basic wounds, and administer medication and food, but if their charges need surgery or other complicated procedures, rehabilitators require the cooperation of a vet. Rina Maguire, a veterinarian at the Center for Avian and Exotic Medicine, a Manhattan animal hospital, occasionally consults with rehabilitators at the Wild Bird Fund. Maguire has worked at wildlife centers in California, and does what she can to help, in between caring for her usual, paying, patients. The question always is “Who’s going to pay for it?” she says. Veterinary practices in the city must cope with the high costs of running a small business in New York, and while injured wildlife may need the same care as people’s pets they often have no one to pay for expensive medical treatments. Veterinarians do what they can, when they can, but the demand for care almost always outstrips supply. Maguire and fellow veterinarian Alexandra Wilson are hopeful that the new center set up by the Wild Bird Fund will make it easier for other veterinarians in the city to pitch in, giving an extra hand to the volunteers who are committed to helping New York’s wildlife. My cat attacked a baby squierrl and left a few (non-serious) scratches and marks on his body. Luckily, we rescued the 3 week old squierrl in time and wrapped him in a towel and put him in a box with cloths and a heating pad. We fed him puppy formula out of a plastic syringe for about 4 days. But sadly, the little guy didnt make it and passed away. We are clueless at what happened to him and i was wondering﻿ if you could tell me what happened or what we did wrong?